View Oberon's most popular enclosures and mounting solutions for Aruba APs by selecting your AP model below. See all available Oberon products via the "Products" menu item. Aruba has teamed with Oberon to ensure the availability of Oberon enclosures and mounting solutions for use with a broad range of Aruba Wi-Fi access points. Oberon products offer infrastructure security and environmental robustness, and can help ensure regulatory compliance while meeting end users’ aesthetics requirements. 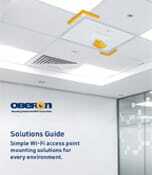 Working together, Aruba and Oberon optimize physical security, aesthetics, maintenance, and wireless performance.